Nadav and Abihu are dead. Consumed in fire. Burned alive. And nobody knows why. They were two of Aaron’s four sons, Temple priests. They went into the Sanctuary to offer a sacrifice, but something went wrong. The fire came out strange somehow and blazed everywhere. They died instantly. Moses, their uncle, told Aaron that it was God’s intention. “Through those near to Me I show Myself holy, And gain glory before all the people.” Aaron was silent. For centuries, commentators would speculate what they’d done wrong to deserve death. Perhaps they’d been over-zealous and churned out too much fire. Maybe they hadn’t followed the commandments to the letter. They might have been drunk. But nobody questioned that it was their own fault. God is just. The world is reasonable. And if a bad thing happens, the people who suffer must be to blame. All we can do is silently accept it. Under any scrutiny, it’s an indefensible theological position. In a world so full of inexplicable suffering, it is not possible to tell people who are hurting that God intended for them to feel that way. Death cannot be explained away. We cannot justify people burned alive. We cannot silently accept it. 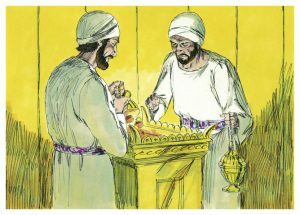 But what if we have been interpreting this parasha all wrong? What if this text isn’t encouraging us into silent acceptance, but to question injustice? What if this isn’t about blaming victims but about challenging oppression? There is a suggestion in the way the story is laid out that there may be more to this story than meets the eye. Our narrative does not begin with the death of Nadav and Abihu, but with sacrifices. Burnt sacrifices of animals. Moses and Aaron go about slaughtering goats, rams and oxen and offering them up to God in fire and incense. Fire went out from before God and consumed the burnt offering and the fat parts on the altar. And all the people saw, and shouted, and fell on their faces. Fire went out from before God and consumed them; and they died at the instance of God. The Torah is urging is to see some similarity between the burnt sacrifices of the animals and the death by fire of Aaron’s sons. The people shouting and falling on their faces stands in direct contrast to Aaron’s silence. Other commentaries have begun from the premise that Aaron’s sons’ deaths were justified. Other commentaries have assumed that animal sacrifice and human death were logically separate. Both, they assume, form part of a cosmological worldview that sees God as just, explicable, and hungry for death. Yet the whole narrative might make more sense if we assume that the reverse is the case. Nadav and Abihu did not deserve to die. Their deaths were senseless and unjust. They died without explanation and their father was expected to cope with it. Their sudden and dramatic death arrests all talk of animal sacrifice. It interrupts our assumptions that there are correct ways to kill creatures and that sins can be expiated with blood. In the moment that Nadav and Abihu die, Aaron gets an insight into what sacrifice is like for the animals. When his own kids are slaughtered, he doesn’t shout and fall on his face, but retreats into stunned silence. This interpretation makes sense of Moses’ cryptic comment to Aaron: “Through those near to Me I show Myself holy, and gain glory before all the people.” The word for ‘draw near’ – קרב – is the same as the word for ‘sacrifice’. The line may be interpreted as saying that God is made holy through sacrifices. If animal sacrifice is holy, why not human? If animal sacrifice makes God appear glorious, why not human? Scholars including Maimonides, Albo and Rav Kook all argued that, ideally, people should be vegetarian. They saw animals as possessing reason and emotions like people. Today, their ideas have new relevance. We live in an era when animals are bred in captivity, kept in cages and killed without thought. When the rules governing kashrut were constructed, they put a firm limit on what violence could be done to animals. Compared to neighbouring cultures where animals could be torn apart limb by limb while they were still alive, the requirement that they should be kept in good conditions and killed as quickly as possible was remarkably humane. Yet, today, as Progressive Jews, we might rightly question whether those rules go far enough. If we accept that senseless death is unjust and that the Torah is more concerned with calling us to action than silent passivity, it may be time for us, as a movement, to consider adopting vegetarianism. I do not want to moralise to people or be accused of hypocrisy. I am not a vegetarian and I’ve struggled to reduce my own use of animal products. But I want to try. One of the biggest barriers is that it’s expensive and time-consuming. That’s because our society is built around meat and using animal products. That should not, however, stop us from trying. As a religious movement, we could lead the way by changing our own relationship to food and encouraging others to do the same.